Hold on! 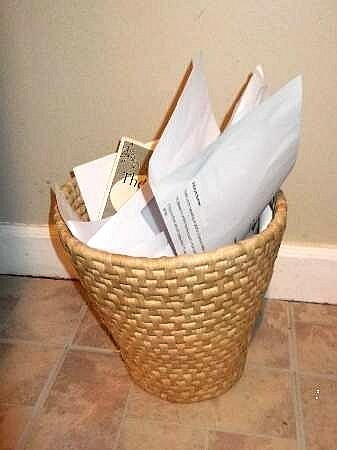 Don`t throw away all that scrap paper! Here is how to make paper mache pulp from it! You can do a lot with this clay and it`s easy to make. Here is the recipe. 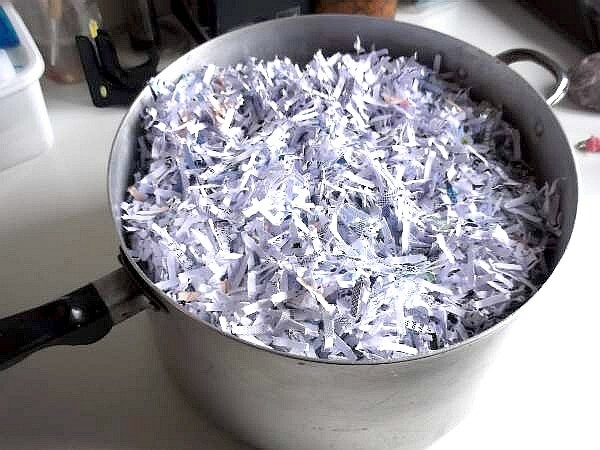 Shred old letters, bills and anything that doesn`t have a shiny or semi-matte finish. If the scrap is coated with polyethylene, silicone, or wax, it will be water resistant and make your pulp feel like there are little plastic bits in it. I obtained my material from a local office. They were pleased to get rid of it and depending on what color the shredding was, it made an interesting combination to the finished product. Collect at least a large pot full of shedding. You can shred the paper by hand if you do not have a shredder but the smaller the pieces are the better and smoother the clay will be. I use hand-ripped strips for when I am making paper mache puppet heads or bowls and containers. Once you have filled the pot, add water to cover it and bring it to the boil. Turn it down and simmer for about 1 hour. This "cooking" helps to break down the paper and lessens the soaking time. I leave it overnight to soak and cool. Squeeze out most of the water but not so much that the pulp feels dry. Break up the lumps with your fingers just like you would when making dough. Once you have done that add the PVA (Elmer`s) glue. There is no hard and fast rule to how much glue you use but it needs to be enough to make the paper bond. 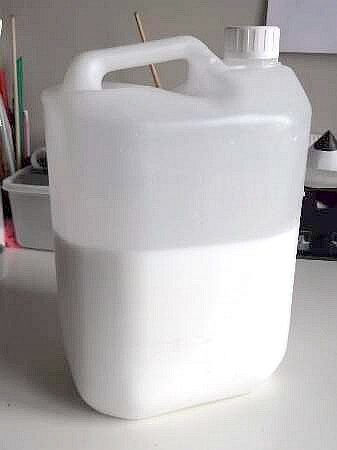 I use about 2 cups to a full large pot of dry paper. Once mixed, if the clay behaves like clay and sticks together nicely, then I am satisfied. If not, then I add a little more. Keep mixing and needing the clay until it feels quite squeegee and smooth, not dry or the kids will find it hard to work and mold into shape. You won`t get it smooth like dough. You can only do that if you use a finer material like toilet tissue with some other ingredients added. This is what many professionals use for a finer finish to their sculptures. But for kids crafts, our recipe is perfect! Now your paper mache is ready to use. You can apply it to a wire mesh shaped to what animal or object you like, or you can use a container as a mold. I made decorative hearts from heart shaped molds and you can see how to make paper mache hearts like them here. Place the sculptures in an airing cupboard of somewhere warm to dry naturally. Once dry you are ready for the next stage. Paper mache is a Kool Kids Paper Craft.